There are dozens of wild fires raging in the forest of British Columbia, some a thousand miles to the north of my location, but my city is currently blanketed by a layer of smoke from those fires so thick that they are telling us not to venture outdoors if we can avoid it, and certainly not to exercise outside. But we’re also experiencing a record-breaking heatwave, so on Thursday night, many hours before you can read this, I’m sitting outside with my laptop because it is somewhat cooler out here than inside. Usually the third paragraph of these weekly round ups says simply that here are the links sorted into categories. But I think I need to change things a bit. I’m a news junkie and I approach the weekly roundup from my perspective as a queer man concerned with the future of the american republic and the world at large. But some people take some of those links differently. So I’m going to lead off with Science and other topics that are non-political this time. I’m going to finish off with music videos as I usually do. The things some people classify as politics/proof how awful the world is/etc will still be here, but you can skip down to the music once you hit those if you are so inclined. Evidence mounts that the first cities are much older than we thought. Kepler Spots the First Exomoon Candidate 4000 Light Years From Earth. Eat, Pray, Fossilize? Praying Mantis Fossil Is 110 Million Years Old. Death Valley just experienced the hottest month ever recorded in the U.S..
Bee Extinction Is Threatening the World’s Food Supply, UN Warns. Scientists Reversed Glaucoma in Mice With the Help of a Single Gene. Spiny Worm Beast Haunted the Seas 500 Million Years Ago. Scientists Just Discovered the Oldest Asteroid Family Ever. Physicists Capture the Elusive Neutrino Smacking Into an Atom’s Core. Wow! Hubble Telescope Detects Stratosphere on Huge Alien Planet. Apollo Astronaut Penlight Shines Again as Nautical Lantern Maker Replica. Hot and hazy: Smoke from B.C. fires will hang around Seattle. 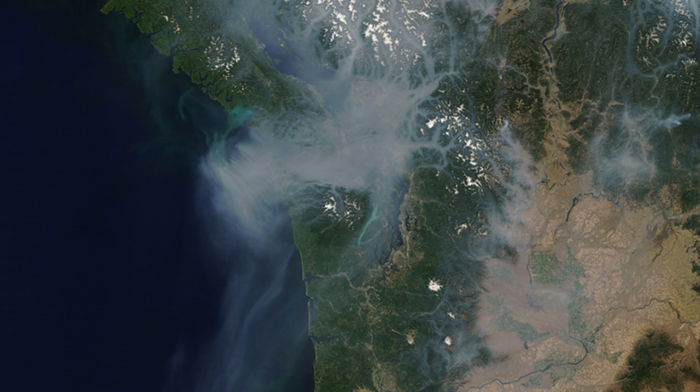 Giant Canadian Smoke Cloud Covers Puget Sound: NASA Photo. Blistering Heat Wave Threatens Seattle, Where Only a Third Have Air-Conditioning. Where’s the AC? Heat grips Portland, Seattle. Seattle’s heat wave, wildfire haze could linger into next week, weather service says. Western Heat Wave Breaks Record Highs in Oregon and Washington. WHEN SHE WAS CAMP: BUFFY TURNS 25. Maybe the A.I. dystopia is already here . THE BEST AND WORST TIME TO BE AN X-FAN. Two Sides to Apple’s China Story. How to Hack an Election in 7 Minutes. NAACP issues its first statewide travel advisory, for Missouri. Christians are more than twice as likely to blame a person’s poverty on lack of effort. Of Course Abortion Should Be a Litmus Test for Democrats. There’s no evidence that immigrants hurt any American workers. Texas Republican warns religious right getting “out of hand” with bigoted bathroom bill. Self-loathing closet cases who bilk taxpayers to lavish international trips on their boy toys must be outed. Court docs reveal Aaron Schock’s aides urged him to stop acting so ‘gay’. Aaron Schock gay rumors: More than just snarky jokes. Aaron Schock Outed As Gay By Itay Hod, Journalist, On Facebook in 2014. The 7 gayest Aaron Schock Instagram posts. 5 things Trump did while you weren’t looking: Week 8. CNN’s Jake Tapper destroys Trump: Russia seems like the only one that can control the president. Trump Cabinet Secretaries Attend Bible Study Led by Extremist Pastor ‘Not Biblically Qualified for Spiritual Leadership’. This pastor’s own church and ministry decided he isn’t qualified to lead Bible studies, so of course the Trumpites are pretending to listen to him. Lawsuit Alleges Fox News And Trump Supporter Created Fake News Story. The lawsuit includes enough evidence to drop the word ‘alledged’ from that headline. Brinkley: Trump is ‘unfit for command. Trump’s Dangerous Incitement of Police Violence. Read the Full Text of Bill Browder’s Testimony to the Senate Judiciary Committee . Democrats Aren’t In Lockstep Over Abortion — That’s Why They’re Fighting. Dem campaign chief vows no litmus test on abortion . This is a really bad idea. I should write a blog post on why, for a legal and logic point of view this is a supremely bad idea. Why are Rand Paul and Kamala Harris teaming up on a bill? Because the whole point of the U.S. Republic is that sometimes we find alliances in unlikely places? Sen. Mazie Hirono Holds Back Tears During Impassioned Health Care Plea. William Shatner Attacks Snowflakes, Social Justice Warriors, and Misandrists. xJesse Lee Peterson Claims African Americans Were ‘Better Off’ Under Jim Crow. Maybe Taking the Arguments of Nazis At Face Value Is Bad. Weekend Update 7/29/2017: More Words and Pictures. Settling in to the new place. You never know where you’re goin’ ’til you get there! (or, Revising my goals). It’s not a food allergy & other misconceptions about diabetes. Everybody was kung fu fighting, even mighty whitey — more of why I love sf/f.